Do I have to travel into the Houston Medical Center to find a good dentist? 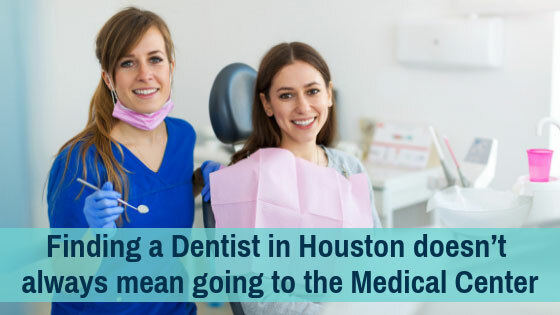 Finding a quality dentist in Houston doesn’t automatically mean going to the Medical Center. Although, Houston’s Medical Center is one of the most advanced in the world, with facilities that attract people from all over the globe, Houston’s medical and dental talent can be found all over the city. There are many talented dentists that have set up their practice outside of the inner loop to serve communities throughout Houston. Anyone who commutes to the Medical Center regularly knows how difficult it can be to drive through, as well as park. Fortunately, this is not necessary. No matter where you are in Houston, there’s likely a quality dentist within a few miles. How can I tell a good dentist apart from the rest? A strong recommendation – Ideally, you have someone you trust to give you a head start on the search. This could be a trusted family member or friend, but it can also be your current dentist, if you’re moving to Houston from another city. It’s always a good idea to consult with your current dentist if you’ll be moving because even if they can’t provide a specific recommendation, they can give you an idea of what to look for in a new dentist. A willingness to earn your business – Dentists are used to being selected in a somewhat random way, so it will probably be a nice surprise if you ask to interview the dentist a bit before settling on them permanently. The word “interview” is used loosely here. Inquire about the dentist’s specialties, who they are comfortable working with, the technology they champion and so on. If you or a family member have special dental needs, make these known as soon as possible. For example, if your children are nervous around dentists, inquire about the methods they use to keep children calm and relaxed. Every practice is different in this regard, so verify that their approach is the one you want for your family. Otherwise, you may be forced into an uncomfortable position during an appointment. You should never settle for a dentist that balks at answering honest questions. If they make you feel like you’re inconveniencing them, look elsewhere. Positive reviews that you can trust – Yes, there is a mountain of online reviews for dentists, but you can’t trust all of them. The most believable reviews are those that relate a story or experience with the dentist in question, as these tend to be truthful. If a review lists a ton of general stuff that concerns the practice as a whole, it could be a fake. If a dentist has earned a lot of believable, positive reviews, then that’s a good sign. It’s especially promising if the dentist is getting positive reviews due to their patient handling methods. Dentists that address a patient’s needs directly are dentists that are usually solid all around. An easy office staff to work with – When selecting a dentist, you’re not just picking a dentist. You’re selecting their entire staff, so make sure it’s a staff that you can work with easily. Although you’ll never know for sure until you visit the practice and interact with the office staff directly, you can still tell a lot by how the appointment-making process goes. If setting up or rescheduling an appointment is difficult, factor this in. That same staff will be responsible for ensuring your prescriptions are sent to the right place and on time. An inefficient and careless staff could make your day a nightmare if they are liable to make mistakes on the important details. Strong communication – Chances are, the only people in the examination room that understands dentistry are the dentist and their assistants. That means you’ll have to rely on your dentist to provide you with any information regarding your dental health and treatment options. Medical professionals, including dentists, normally succeed on their experience, education and abilities, and not on their ability to communicate. That means you never know what you’ll get from a dentist regarding their patient handling until you’ve sat in the examination chair. So, did the dentist explain everything fully? Did they explain exactly why they recommend certain treatments? Did they show you the X-rays and point out where your teeth need some work? Did they sit there and answer your questions without hurrying you out the door? The ability to communicate is clearly a valuable trait to have in a dentist, but it’s one that so many dental professionals fail to develop. It’s a trait to target, though, because a dentist that communicates poorly is one that you will struggle to build a strong dentist/patient relationship with. That may seem like a long list of demands to detail for a dentist, but there are plenty of Houston dentists that can check all the boxes. Although there are many dentists in Houston, including The Woodlands, Humble, Kingwood, Spring, Cypress and Katy, the location of a dentist is not as important as the quality of the staff and the thoroughness of the care you receive.